With a price on her head by an arms dealer and a leak at the CIA, assassin Fortune Redding undertakes her most difficult mission ever…in Sinful, Louisiana. 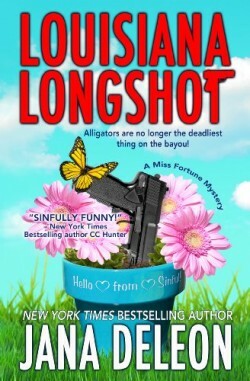 Posing as a former beauty queen turned librarian in a small bayou town seems worse than death to Fortune, but she’s determined to fly below the radar until her boss finds the leak and puts the arms dealer out of play. Unfortunately, she hasn’t even unpacked a suitcase before her newly inherited dog digs up a human bone in her backyard, and the local deputy is asking her too many questions. If she’s not careful, this investigation might blow her cover and get her killed. Armed with her considerable skills and a group of elderly ladies the locals dub The Geritol Mafia, Fortune has no choice but to solve the murder before it’s too late.